Villawood detention centre—past, present, and future — Refugee History. In recent years, Australia has led the rich, white, and fearful world in sharpening, hardening, and externalizing its borders. Asylum policy has been caught up in its increasingly carceral approach to migration: all non-citizens not holding a valid visa, including people seeking asylum, are subject to indefinite detention. Those who attempt to enter by sea are concentrated far offshore, on Manus Island, Nauru, or Christmas Island—remote sites far from democratic and judicial oversight or civil society’s scrutiny. Meanwhile, onshore detention centres are being closed down. But there’s one exception, in the western suburbs of Sydney, which will remain open: Villawood. You can find it on Birmingham Avenue, a long, dead-end street that comes off a busy through route opposite Leightonfield station. It’s the kind of road you might never go to unless you worked there, but that your life is closely connected to nonetheless. It bends between light industrial units occupied by businesses that pack and process the food you eat, recycle the clothes you throw away, split and saw the wood your furniture is made of and your house is built from. I went there last August. Villawood was once the site of a migrant hostel, built after the second world war to provide accommodation for immigrants on what had been part of an explosives factory. The war had left Australian policymakers keenly aware of the country’s geographic isolation, and from the later 1940s the government-sponsored mass immigration to offset it: ‘Populate or perish’. Populate with Europeans, that is: these were the years of the ‘white Australia’ policy, a range of administrative measures used between federation in 1901 and Gough Whitlam’s premiership in 1973 to restrict admissions to the country—legislation that generally avoided racist terminology, while permitting racist immigration restrictions in practice. Searching for immigrants after world war two, Australia initially targeted Britain, but without much success. So the government looked elsewhere: first to the displaced persons’ camps of postwar Europe, and then to other European countries. A million people had arrived by 1955, and the mass immigration programme continued for a decade or more beyond that. For these generations of immigrants, accommodation on arrival was provided at one of sixty-four sites operated for the government by Commonwealth Hostels Ltd. It’s hard to overstate the importance of these migrant hostels in modern Australian history. The largest of them was at Bonegilla: between 1947 and 1971, over 300,000 people passed through that site alone. Something like 1.5m Australians today (over five per cent of the population) either lived there themselves or are descended from people who did. Bonegilla, in the foothills of the Snowy Mountains, was close to the works for a mammoth hydroelectrics-and-irrigation scheme. Villawood was less remote. When you walk up Birmingham Avenue today it’s odd to think of thousands of migrants living in subsidized accommodation there, but the next stop on the railway into town from Leightonfield, Chester Hill, is surrounded by shops and houses. Halfway between the two stations, Miller Road crosses the line at right angles, marking a border between residential and industrial zones. Locating the hostel out here put migrants close to jobs in the industrial zone as Sydney’s western suburbs expanded. I spoke to an architectural historian, Renée Miller-Yeaman, about the Villawood hostel. At first the migrants there were housed in Nissen huts, corrugated iron military huts. Few of these were used in Australia during the war: instead, thousands were bought from the British government in the late 1940s, though hardly any survive. They provided basic accommodation for the postwar migrants. Although Australian policymakers were committed to increasing the country’s population through state-supported mass immigration, there was a housing shortage, and the government faced pressure from its people—including returning servicemen—to provide better homes. The existing population, extremely homogeneous until this period, was ambivalent about immigration, especially in the early postwar years when most of the newcomers were ‘reffos’ from European displaced persons’ camps, often Jewish. To avoid fuelling anti-immigrant sentiment, the government had to ensure that migrant housing was visibly inferior to the houses of the existing population, and Nissen huts fitted the bill. The people living in them weren’t necessarily happy with this arrangement, especially as the sources of migration shifted from the DP camps to the countries of central and southern Europe: at Villawood there were repeated protests in the 1950s about crowded accommodation, poor food, and overbearing staff. William and Margaret Young lived in the hostel after they emigrated from Glasgow with most of their eight children in 1963 (one older boy stayed in Scotland). At Villawood, their son George met another recent arrival, a Dutch teenager who had given up his foreign-sounding name Johannes Hendrikus Jacob van den Berg to become Harry Vanda. George and Harry played together in a successful late-60s band, The Easybeats, but as Vanda and Young they had a more lasting career writing and producing for other acts. They produced the first several albums by AC/DC, the band that George’s brothers Angus and Malcolm formed in 1973. Angus, the youngest child in the family, was seven or eight when they arrived in Villawood. When the Young family lived there the Nissen huts were being replaced by modest but homier two-storey flats, and photos from the early 1970s show a fairly pleasant set of buildings. You can’t see these from the road today, though, or much at all, because beyond a large parking area, a high wall topped with fencing rings the entire site. The car park dwarfs those of the industrial units down the road, but its entrance isn’t marked. 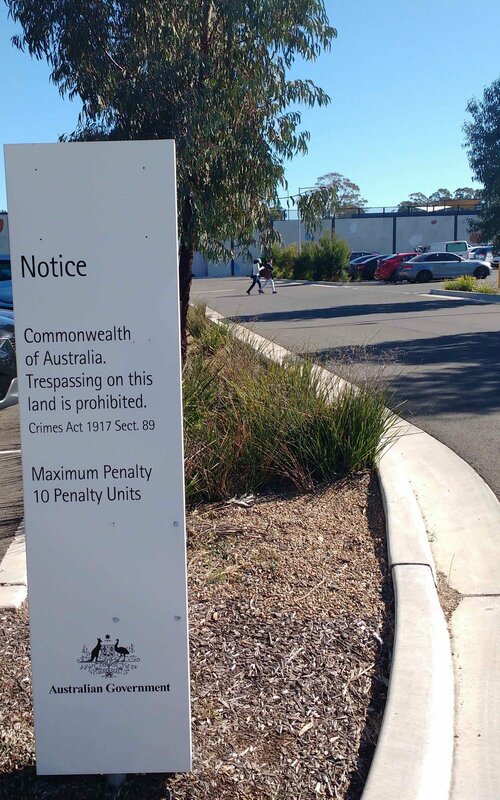 An Australian government notice warns you that trespassing on this land is prohibited under the Crimes Act 1917 Sect. 89. (This seems to be a mistake, as the act in question dates from 1914). In Australia’s points-based penal system you can incur a maximum of ten penalty units for breaching the prohibition, though I don’t think the car park counts, and no-one stopped me as I walked up to the front door and took a picture of what a sign on the wall finally identifies as Villawood Immigration Detention Centre, run by the Australian Border Force. Villawood is the only on-shore IDC that the border force plans to keep in operation. Much of the facility appears brand new. At one end of the site a fence topped by a cylinder beam forms part of a heavily surveilled double security perimeter. At the other, the car park is overlooked from behind a fence by a tightly packed residential development of two-storey homes, so new that the buildings don’t show up on the aerial view in Google Maps yet. Walking back out of the car park I noticed that while it doesn’t have any signs identifying the way in, the way out is marked with signs in English, Arabic, Farsi, Chinese, Pashto, and Tamil. The selection of languages doesn’t have much to do with the main countries of immigration into Australia, but it does map closely onto the main countries of origin of people seeking asylum there in recent years. Birmingham Avenue continues beyond the new facility, skirting the open grassy area on one side and hemmed in on the other by a high white wall. It ends at the older part of the detention centre. The migrant hostel at Villawood closed in the early 1980s, and by then this part of it had been operating as a detention centre for several years already. 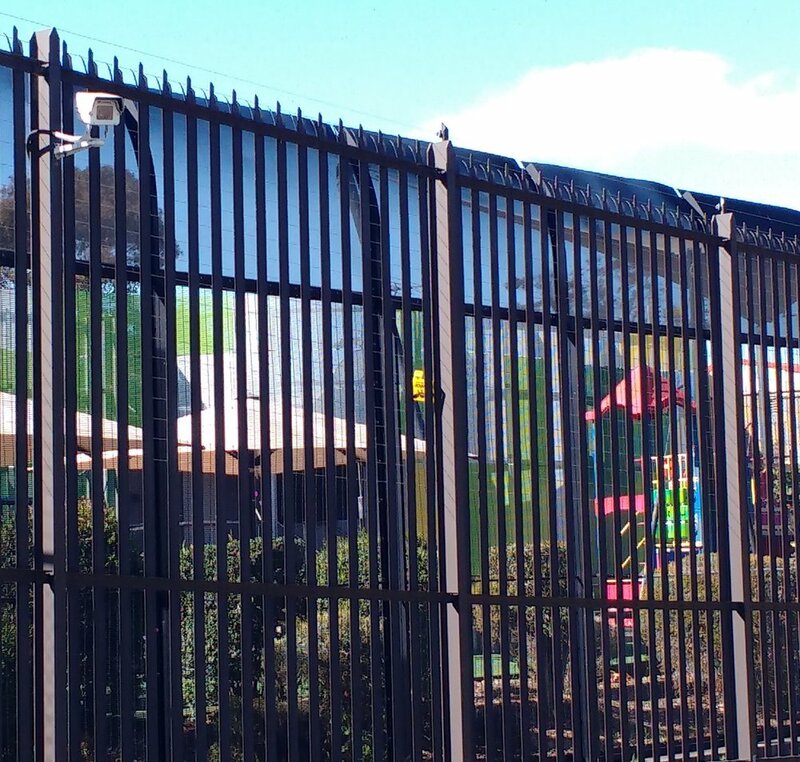 It has a black, spike-topped security fence four metres high, with security cameras. A sign on the gate warns that all vehicles will be searched on entry, and through the gate you can see that vehicles drive into an area that’s also fenced off on the inside. It’s obvious that this is a high-security facility, but there’s no sign to indicate what it is, just a tall green panel-post of the kind you see in front of office buildings in business parks, bearing the name Blaxland. I went to Villawood while I was in Australia on a short fellowship to do with my research on refugee history, but I don’t study Australian history, and I didn’t plan to do any archival work on this trip. I didn’t go to the Sydney reading room of the National Archives of Australia (‘We are the nation’s memory – a living collection of government records illuminating our history and identity’): a friend in Melbourne had warned me that it was awkward to get to, and I was only in town for a few days. I only realized later that the reading room is on Miller Road, and backs directly onto the Blaxland facility. The new detention centre at Villawood has been designed so that you can’t easily see into it: if detainees managed to climb onto the roof and stage a protest, as they did in 2010, 2011, and 2012, only someone in a helicopter would know about it. But at the Blaxland compound you can see through the galvanized steel slats of the outer security fence and the wire mesh of the inner fence. And that means you can see the brightly coloured equipment of the children’s play area inside. All photos by the author except where indicated. Read more about the detention centre here.